Caribbean style beautifull building brand new. Its perfect location allows get you to the seaside just in 5 minutes walking, and only 2 blocks from the famous 5th Avenue. Building has 11 studios, 1 bedroom apartment (that you can trnasform in 2) and the local space for restaurant or similiar. On the ground floor the commercial space could be perfecto for the Bed and Breakfast restaurant for this Boutique Hotel. All of units has around 45-48 m2 each one. 4 of them has street view. Those have bed, bathroom, small refrigerator and a great size balcony with a nice shadow from bamboo sticks that form the frontage of the building. Those have a hotel room character: very comfortable, nice and functional. 7 other studios have bed, sofa (to sleep for 1 persoan), kitchenette and the bathroom.Fully furnished and equipped. On the last floor you find an apartment of a nice size. It has 1 bedroom with its full bathroom and closet, kitchen and a space with a bed, closet (you can close it as a separate bedroom) and with a table-bar to eat and the second bathroom. At the same level you have común area to enjoy nights with margarita nad a barbecue. On that roof top you have small swimming pool and space to rest with a great ocean view. It has also the laundry room with 3 washing centers for comun use. 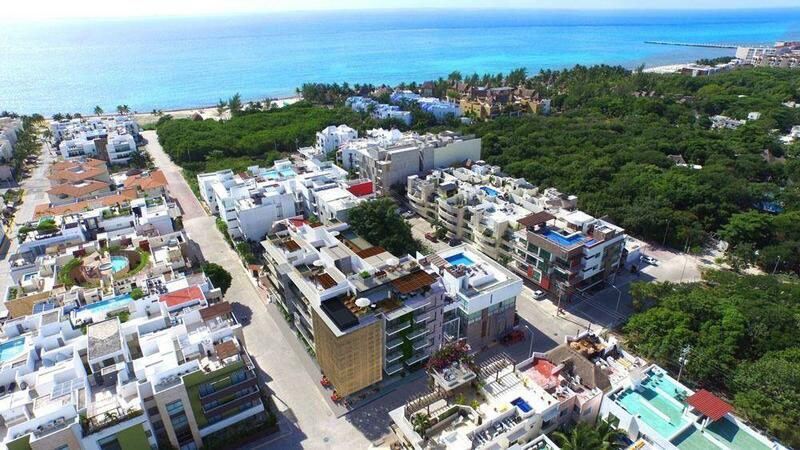 Being on the 15th Avenue you are very close to all stores, supermarkets and all the services and you are on the sight of Zazilha, the area of high level in Playa del Carmen. Building is fully furnished and equiped and is on vacationbal rentals regeem working.